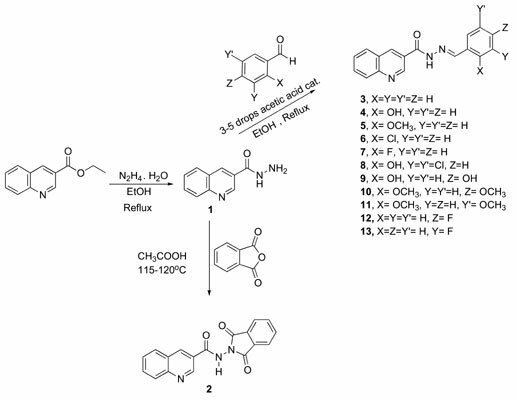 A series of biologically active 3-quinoline carboxylic acid hydrazide-hydrazones has been synthesized from 3-quinoline carboxylic acid hydrazide and a variety of aldehydes, with moderate to good yields. The chemical structures of the new products were confirmed by elemental analysis, IR, and 1H NMR, 13C NMR spectral data. The structural and frontier molecular orbital (FMO) properties and the density functional theory (DFT) calculations were conducted for the new compounds. The new hydrazide-hydrazones exhibited low to moderate antibacterial activity against Staphylococcus aureus and Esherichia coli in comparison with gentamycin. Among the tested compounds, compounds 9 and 13 were found to be the most active. Phthalimide derivative 2 of 3-quioline carboxylic acid hydrazide showed remarkable antibacterial activity. Hydrazide-Hydrazone, quinoline 3-Carboxylic acid, antibacterial activity, theoretical study, DFT, FMO.